Children are particularly good at being carefree, natural and open with animals. Especially for horses there is a particularly intimate wire. Dealing with the gentle four-legged friends promotes the personal development of children and teenagers in many ways. In Pitzis Kinderhotel there are ponies and horses waiting for the little and bigger guests. From April to November we offer Ponyriding through the village with our guide. There, the adults can guide the ponies through Wald im Pitztal. From April to November we offer riding lessons for adults and children from 5 years with our riding instructor . In addition to good-natured Welsh-Haflinger Mix horses, we also accommodate Saxony-Anhalt Warmblüter on our horse farm. Riding lessons take place in our Longe . From April to November we also offer an intensive riding lesson for adults and children from 7 years with our riding instructor (fee required). In addition to the good-natured Welsh-Haflinger Mix horses, we also host Saxony-Anhalt warm-blooded animals on our horse farm. The riding lessons take place in our lunge and on our paddock. To arrange dates for pony rides and riding lessons, please contact our team! We will be pleased to answer your questions about riding. Pony and horse are the hit on vacation with children!Especially Girls build a very special relationship with the big quadrupeds and look forward to every minute they can spend time with the animals. Would you like to spend your summer holidays in the Pitztal in Tyrol? 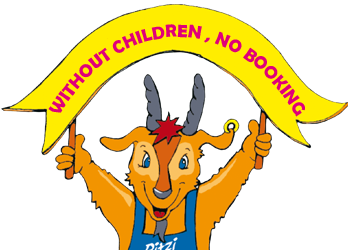 Pitzis Kinderhotel will gladly send you a non-binding offer!